A few weeks back, I was sent a Himalayan Salt Lamp from Himalayan Salt Shop to test out and review. 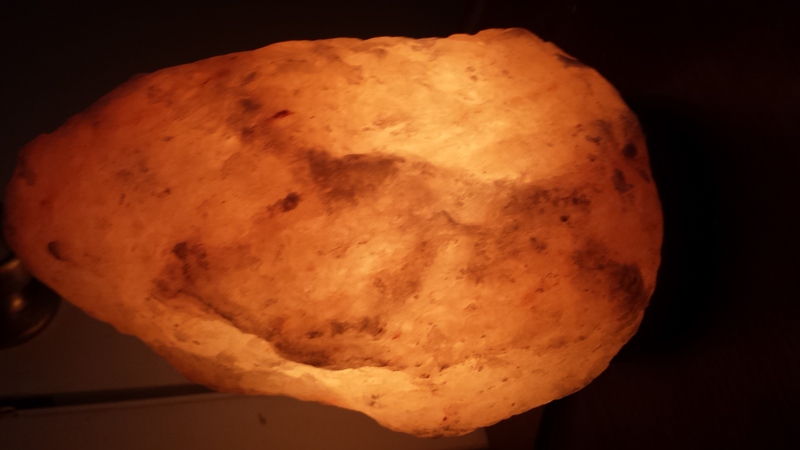 Essentially, the lamp is a large chunk of Himalayan salt that is hollowed so that you can place a light bulb in it. As the salt warms up from the heat of the bulb, it releases negative ions which helps remove pollen, dust, bacteria, and more from the air. It also offsets any positive ions from electronic equipment as well. I have always wanted one of these since the first time I saw some in a shop. They look really neat and give off a relaxing soft glow. When it first arrived, I was surprised at how heavy it was. It’s between 5 to 7 lbs, which is perfect to cover the room I have it in (covers 10ft x 10ft). I primarily turn it on in the evening a few hours before I get into bed, and then turn it off once I’m in bed and have read for a while. I placed it on the night stand next to my bed. I noticed a difference in the air quality after the first two days of using it. It overall feels/tastes fresher and my allergies haven’t been bothering me in there at all. I also noticed that I haven’t been getting as many headaches. I don’t know if that’s due to the allergies not being aggravated as much or if it’s cutting the output off of my cell phone when it’s plugged it (which has bothered me a lot in the past). Whichever it is, it’s a welcome improvement. Overall, the lamp is very nice. It looks nice and does help the air quality. 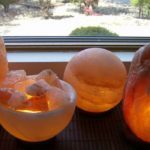 The Himalayan Salt Shop was a large assortment of lamp available, as well as other salt products. The lamps will vary in price depending on the size. You can check them out by visiting their website. Right now, you can also save an additional 20% off your order by using the code USFAMILY during checkout. Last updated by Angela Rogers at August 11, 2016 .